The .NET platform offers a new and completely redesigned collection of classes for data access that takes into consideration modern application requirements for distribution, reliability and scalability, plus a provider-independent data access model (System.Data.Common) which enables developers to write ADO.NET code that works against any .NET data provider. So in terms of the .NET framework, the way to access data has changed: .NET uses XML as its underlying data structure, and even records from database are represented internally as XML, which is then converted to the data type required by the client application. Data access classes and methods have been re-written by Microsoft, building a new version of ActiveX Data Objects (ADO) called ADO.NET. Interoperability: All data in ADO.NET is transported in XML format. The data is provided as a structured text document that can be read by anyone on any platform. Scalability: ADO.NET promotes the use of disconnected datasets, with automatic connection pooling bundled as part of the package. Productivity: ADO.NET can improve overall development time. For example, typed DataSets help you work more quickly and allow you to produce more bug-free code. Performance: Because ADO.NET provides disconnected datasets, the database server is no longer a bottleneck and application performance is improved. The Visual Basic Upgrade Companion migrates the legacy data access models (ADO, RDO, DAO, ADOR) to .NET equivalents, employing special transformation rules and helper classes (for some specific source/target combinations). 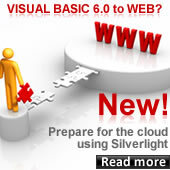 The Visual Basic Upgrade Companion provides different alternatives to upgrade the data access model to ADO.NET. For example it is possible to upgrade ADO into ADO.NET using the SqlClient libraries. This works perfect when using SQL Server, but if you want your application to connect to any database using a compliant .NET data provider, our tool generates code that uses the classes introduced with version 2.0 of the .NET Framework in the System.Data.Common namespace. Besides the Data access libraries, the tool is able to upgrade the ADODC and MSRDC data controls. The following example demonstrates a simple usage of ADO for data access with a simple query execution. The Upgrade Wizard generated source code utilizes the same ADO technology to interact with data sources via COM interop wrapper calls, as seen in this example. 'UPGRADE_WARNING: Couldn't resolve default property of object db.Open. 'UPGRADE_WARNING: Couldn't resolve default property of object rs.Open. 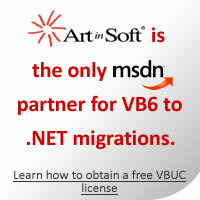 The Visual Basic Upgrade Companion generated source code employs .NET data access constructions. The user can select from different available techniques to upgrade the data access methodology from the tools Profile Manager screen. Besides the target language, the user can also select the data access library to be employed (SqlClient or System.Data.Common). com.CommandText = "SELECT * FROM Table1"